The news is full of Salmonella and E. coli outbreaks these days. No food seems to be immune. What is generally swept under the rug in discussions about raw milk, however, is the protection given by lactic acid-producing bacteria normally present. 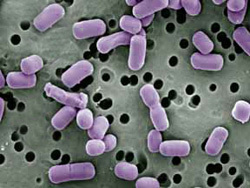 In what microbiologists call the principal of Competitive Exclusion, non-pathogenic bacteria like, say, Lactococcus lactis, can actually limit or kill bad bugs like Listeria monocytogenes, responsible for hundreds of illnesses yearly (2). It seems lactic acid is really hard on the germs that can make us sick if their numbers get too high. Nice system! But make no mistake, ANY food can be contaminated (3). It usually boils down to how it was produced, handled and packaged. (Certainly, low quality raw milk in the mid-1800's, contaminated with tuberculosis bacilli, had its unwanted share of the limelight). Lots of variation exists in each of these areas. And besides, not many foods have built-in lactic acid producers policing the neighborhood. Take the pasteurization process, for instance. While it certainly destroys bacteria, good and bad (and thus reduces the potential for infection), it's far from flawless (4). Pasteurized milk still sickens people, and in far greater numbers than the more heavily regulated raw product (5). The real question ought to be, how are pathogens getting anywhere near cows to begin with. The Swedes have practically eliminated Salmonella from their herds. At one dairy feeding organic grass to their cows, the very manure is pathogen-free (6)! Raw milk from cows fed diets heavy in grain (7), soybeans (8) and cottonseed meal (9), etc., apparently cannot effectively protect itself from pathogenic infection. Everyone agrees, it must be pasteurized. Heating milk renders its immunoglobulins less capable of bacterial self-defense (10). With the destruction of its tiny bacterial lactic acid factories and other heat-sensitive anti-microbial substances, it can no longer protect itself as effectively (11)(12). To repeat: without the minerals and nutrients from a diet of fresh green grass that millions of years of evolution have coded for, the milk is just not made with the normal bevy of bactericidal ingredients designed by Nature to stifle unwanted microbial growth. Know the source of your raw milk and demand that it be from predominantly grass-fed animals. Preferably organic. Ultimately, you'll have to draw your own conclusions, but don't accept the word of any so-called expert (including this site) when it comes to feeding yourself and your family. Question everything you put in your mouth. Seek out information on how your food was produced. Find out what substances were added or removed to enhance somebody else's profit margin. Don't let the government and the giant food companies do your homework/thinking for you. Your health must be in your hands alone!